Kaual Nature Tours vary by geographic location and difficulty. 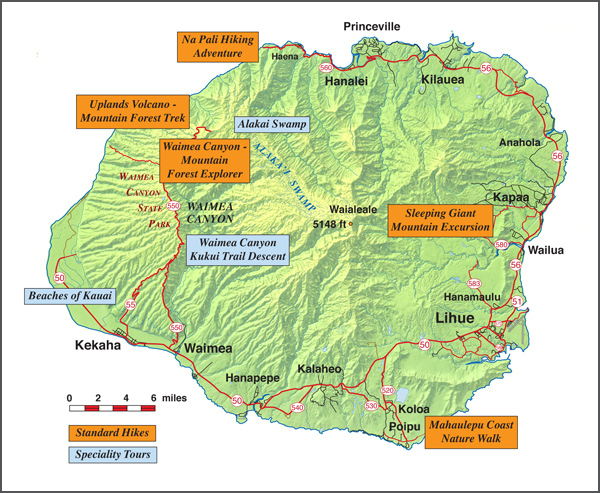 Please read the descriptions below to find the appropriate ability level that meets your capabilities for our tours that hike Kauai. This only moderately difficult 5.5 mile loop hike loses and gains 400-800 feet in elevation as it goes down and up through cloud forests to the canyon rim. It is mostly sunny, but can be wet. The trail is dirt with some rocks and tree roots. Click here for more information about this hiking tour. This out and back trail adventure ranges from a moderately difficult 4 mile (round-trip) option to Hanakapiai Beach, to a more strenuous 8 mile (round-trip) excursion on up Hanakapiai Valley to its 400-ft. valley head waterfall. Weather and trail conditions are highly variable, rocky and commonly muddy/slippery. Several stream crossing are necessary up valley. Click here for more information about this hiking tour. This is an easy to only moderately difficult point to point 4.5 mile hike up and over the Nounou Mountain ridge. There is only one steep but short ascent to the summit for lunch with incredible panoramic views. The trail can be muddy at times with some rocks and tree roots. Click here for more information about this hiking tour. This is an easy one-way 2.5 mile, 4 hour nature walk with very little elevation change. You will walk on a trail that is mostly dirt with some rocky and sandy stretches. It is almost always dry and sunny with an ocean breeze. Opportunities exist for snorkeling and swimming after lunch. Return after lunch is via air conditioned van. Click here for more information about this hiking tour. This strenuous hike varies in length from an out-and-back 9 mile option to a loop of 12 miles. The elevation drop and gain is 1,500-1,700 feet. The trail can be slippery and wet while in the upland forest, to dry and rocky to the edge of the Na Pali. For experienced hikers, this is an incredible experience. Click here for more information about this hiking tour. We ask our participants to wear comfortable shoes. Running shoes are acceptable for most of our tours, while some hikers prefer sport sandals. However, we think that lightweight trail shoes/hiking boots are the best. The more ankle and arch support you have the better! We ask everyone to bring sunscreen lotion and your camera with plenty of film or a large capacity memory card. It’s also a good idea to have a hat and sunglasses with you. We provide lightweight backpacks, but If you prefer your own, please bring it. Lightweight rain jackets are always good to have along in your backpack, just in case. We look forward to meeting you!